Mynard, J., Pinter, A., & Werner, R. J. (2015). Self-access and young learners: Introduction to the special issue. Studies in Self-Access Learning Journal, 6(4), 322-331. The theme of this special issue is self-access and young learners as the editors felt that bringing these two active areas of research and practice together was long overdue. In recent years the theme of ‘learning beyond the classroom’ has received an increasing amount of attention (e.g. Benson & Reinders, 2011; Council for Learning Outside the Classroom, 2015), and the editors take this as a starting point for exploring what support might be appropriate for young learners beyond the classroom. Institutions investing in self-access support for language learners tend to be at the tertiary level, yet there could be benefits for learners if such support were available in schools, public spaces, and community centres. Surely, if we are to equip our learners with skills for autonomous learning beyond the classroom, then the earlier we start, the better? In order to be able to make suggestions on directions for the most appropriate kind of support, it is necessary to explore how young language learners are already learning languages beyond the classroom and how educators are promoting autonomy and metacognition in formal classroom settings. Three contributions to the special issue focus specifically on learning beyond the classroom. In the first article, Heeyang Park, from the University of Warwick in the UK, explores the role of young English language learners’ (ELLs) play, particularly when making choices that affect their own language learning. The author shares an exploratory case study of a 5-year-old Korean English learner in order to illustrate how a very young learner makes decisions about her learning and takes an active role as a research participant. The author describes how storybooks are being used as self-access resources in spontaneous play at home. 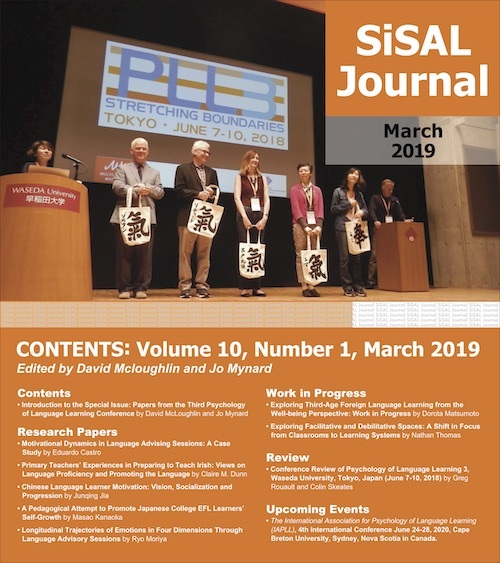 In another contribution investigating young learners’ study outside the classroom, Chika Takahashi from the University of Ehime in Japan examines the structural relationships among factors affecting self-instructed learners’ persistence in learning by using self-instructional radio (SIR). The study takes place in a Japanese high school with ELLs. The author investigated self-instructed learners’ motivational bases and their relationships to persistence by administering a questionnaire and testing two models using structural equation modeling. The results suggest that the levels of motivation and the quality of learning from using these materials were related to persistence in learning. The author also notes, however, that simply persisting in learning through use of the materials does not mean that learners are confident in L2 communication, so further practice is necessary. The potential for gaming to play a role in language development outside the classroom is already beginning to receive attention in the literature (e.g. Sundqvist & Sylvén, 2014a; 2014b). In this special issue, Pia Sundqvist from the University of Karlstad in Sweden reports on an interview study of Eldin, an exceptional 14-year-old Bosnian boy living in Sweden. The study investigates how Eldin became a gamer and how he engages in self-access gaming in English and is strongly motivated to learn English. Drawing on language learning motivation theories (Dörnyei, 2007; 2009) and Dweck’s (2006) concept of mindsets, the author shares the analysis of an in-depth interview in order to understand Eldin’s experiences of successfully learning English – largely through gaming. Although only a few writers (e.g. Gardner & Miller, 1999; Vettorel, 2015) have focussed specifically on self-access language learning aimed at young learners, we can draw upon work on developing autonomous learning skills in the classroom (e.g. Ellis, 2011; Ellis & Ibrahim, 2015; Pinter, 2006) as a way to introduce students to self-access learning. In addition, work on promoting critical thinking in young learners (e.g. Ellis & Ibrahim, 2015; Puchta & Williams, 2012) can also inform our practice. Two contributions to this special issue explore how learners might initially be prepared for self-access within the classroom. In exploring metacognitive development and autonomy in the language classroom, Robert J. Werner and Yu Kobayashi look at how sixth grade Japanese learners describe their understanding of learning processes and the strategies they employ. While the Japanese educational system allocates a very small number of hours per year to elementary English instruction, the article reports on types of strategies (see Ellis & Ibrahim, 2015) and ways learners might use them to improve their language skills both in the classroom and beyond. In their article, Feng Teng and Fang He introduce the idea of working with flashcards in a Chinese primary classroom and claim that this approach can motivate young learners to practise and learn new vocabulary. In this study the children were introduced to a range of different techniques to make flashcards, and then they were invited to make flashcards about new words in each lesson. They were free to put as much or as little information on the cards as they wanted. The results indicated that some children filled in the cards with useful information that helped them to remember words, and they also enjoyed working on these cards outside the class. The authors argue for the use of flashcards to encourage practice outside lessons and learning which can lead to more autonomous behaviour. Ian Adkins and Devin Unwin from the British Council, Madrid share an overview of a project which aims to redefine their current library space for young language learners, making it into a self-access centre with a counselling service. After describing the context, the authors outline proposed support systems which emphasise the importance of training for learners and teachers in order to foster autonomous learning. Support will initially be somewhat structured and will normally be a result of teacher referrals, but the nature of the support is likely to change over time and be sensitive to learners’ developing awareness. We watch this innovative project with interest and hope that the authors write another progress report in the future, which could be very helpful for other centres considering implementing a self-access and/or advising service for young learners. We are fortunate to be able to feature in this special issue reviews of two books on young learners, which have been coordinated by our reviews editor Hisako Yamashita. A recent book by Herbert Puchta and Marion Williams (Puchta & Williams, 2012) can be a useful resource for preparing young learners to take responsibility for their language development both inside and outside the classroom. The title of the book is Teaching Young Learners to Think and has been reviewed by Duncan Jamieson who is based at the Oxford Intensive School of English in the UK. Jamieson summarises the theoretical models underpinning the book and also its practical nature and adaptability. Teachers can use the activities in ways that best support their learners and courses, focusing on appropriate lexis or grammar in addition to thinking skills. Nena Nikolic-Hosonaka reviews Stories and Storyline by Sharon Ahlquist and Réka Lugossy (Ahlquist & Lugossy, 2015) in her contribution to this special issue. Nikolic-Hosonaka gives an overview of each chapter of the book and provides an intuitive interpretation of how the authors understand the nature and needs of modern young language learners and how they present ways in which stories can be used to address those needs. The third instalment of the Language Learning Spaces series edited by Katherine Thornton includes a focus on different models of self-access staff training for students. In addition to an introduction by Thornton, the series features contributions by Catherine Jeanneau and Stéphanie O’Riordan from the University of Limerick, Ireland; Ashley R. Moore and Misato Tachibana from Osaka Institute of Technology, Japan; and Naomi Fujishima from Okayama University, Japan. What is clear from the various contributions is that it is beneficial for learners to receive support and opportunities for developing autonomous language learning outside the classroom to pave the way for self-access learning. In the following paragraphs, we provide suggestions for the development of the field of self-access for young learners. Helping learners to begin to take charge of their own language learning once they begin formal education usually involves a shift in thinking and the realisation that, although the teacher can greatly help the process, it is the student who ultimately needs to take charge. Teachers working with young learners have a role to play in establishing a sense of learner autonomy as early as possible. Practical ways for implementation in the classroom are through involving young learners in making decisions – even small ones – as much as possible, and also involving them in critical thinking, (Puchta & Williams, 2012; Jamieson, this volume), self-assessment, goal setting, strategy awareness (see Teng & He, this volume), and resource selection (see Werner & Kobayashi, this volume). Young learners are likely to have limited class time dedicated to language learning, so teachers and caregivers have a responsibility to help learners pursue language learning in meaningful ways outside the classroom. This can be done by selecting suitable resources that not only promote language learning and/or use, but are also motivating for young people. For example, by using the target language when playing games (see Sundqvist, this volume) or engaging in story-related play (see Park, this volume). However, it is not just the activity/resource that is important for learning; there should also be opportunities for communication and further language practice (see Takahashi, this volume). Story books could be considered to be particularly powerful self-access resources for young learners. Stories engage the imagination, help with social and literacy development, and provide a shared and engaging context for language learning. Stories are one of the ways in which the language classroom can be extended to include other areas of a young learner’s life. In practical terms, stories can be integrated into the young learner’s language classroom (see Ahlquist & Lugossy, 2015; Nikolic-Hosonaka, this volume), provided in a self-access centre – or even a shelf in a classroom – at school, or at home (see Park, this volume). There is a large body of literature in general education and sociology that is focussed on young learners acting as researchers and co-researchers alongside adults. In English language teaching, such a focus has not been prominent except for a few studies (e.g. Pinter, 2014; Pinter & Zandian, 2014; 2015). The shift of emphasis from treating children as unreliable and vulnerable objects of research to capable and resourceful subjects and partners in research brings a new opportunity where children learn about research processes and share some control over important decisions with adults. In this process, children are empowered and motivated to learn more and more about research. This has direct links with autonomy, choice and enjoyment. As the field of self-access and young learners is relatively new, further research is needed, and it is recommended to involve young learners themselves (see Park, this issue for an example). As Thornton (this volume and 2015) reminds us, self-access is not just a physical resource centre; humans learn languages most effectively from interacting with each other in a social environment. Optional clubs, activities and events taking place outside class that give young learners the opportunity to enjoy using the target language in a natural and non-threatening environment should be encouraged. Although advising is normally limited to older language learners, the goal is to engage the learners in a reflective dialogue and thought process so that they can gradually develop the knowledge and skills to take charge of their own language learning. There has been limited work in this area for young learners, but it is likely to be a fruitful area for the future, especially as so many resources are available to learners outside the classroom. In practical terms, advising could begin inside the classroom by engaging young learners in dialogue about their dreams, interests, and goals, and promoting metacognitive awareness (see Adkins & Unwin, and Werner & Kobayashi, this volume). This could ideally transcend the classroom if advising were available outside class. Although we benefited from insights from various contexts when editing this special issue, we were unable to feature articles related to actual self-access centres or systems for young learners. We would welcome contributions to future general issues of the journal to help us understand how self-access support is being given to young learners so that we might further expand our knowledge of the field. The editors would like to thank the authors, reviewers and editorial team members for their invaluable contributions to this special issue. Jo Mynard is an associate professor and the director of the Self-Access Learning Centre at Kanda University of International Studies in Japan. She holds a doctorate in TEFL from the University of Exeter (UK) and an M.Phil. in Applied Linguistics from Trinity College Dublin (Ireland). Annamaria Pinter is an associate professor at Warwick Applied Linguistics, University of Warwick, UK, and her research interest centres on all aspects of teaching language to children and working with children as co-researchers. Robert J. Werner is a lecturer in the English Language Institute at Kanda University of International Studies in Japan. He holds an MA in TESOL from Teachers College Columbia University in New York. He has taught elementary school ESL/EFL in both the United States and Japan. Benson, P., & Reinders, H. (Eds.). (2011). Learning beyond the classroom. Basingstoke, UK: Palgrave Macmillan. Ellis, G., & Ibrahim, N. (2015). Teaching children how to learn. Peaslake, UK: Delta. Sundqvist, P., & Sylvén, L. K. (2014b). Language-related computer use: Focus on young L2 English learners in Sweden. ReCALL, 26(1), 3-20. doi:10.1017/S0958344013000232.